Bridgewater mapmaker Scott Lussier started out chronicling the travels of his friends, but has expanded the pastime into a business. Anyone who loves travel has fond memories of places they’ve been. Scott Lussier, 45, of Bridgewater, has started a business, Passport Maps, putting a place to those memories for his clients, creating maps of destinations that include photos and corresponding legends to points on the maps. 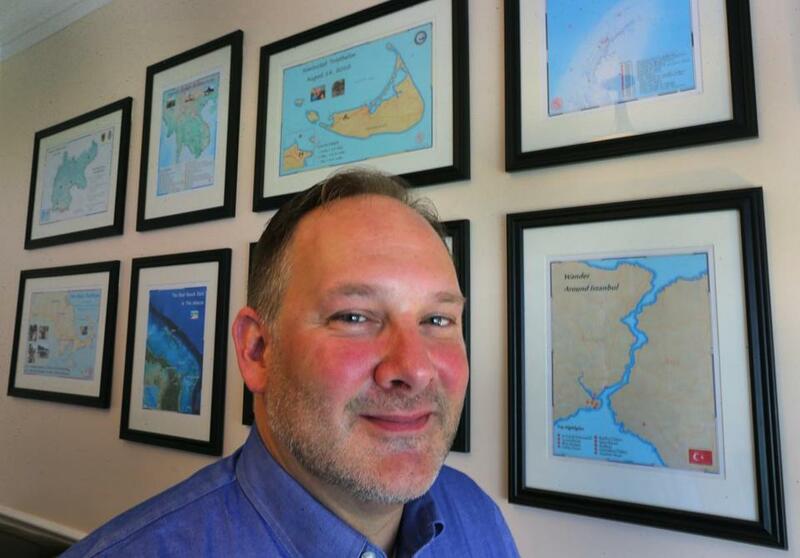 Lussier, a professional mapmaker, is also a geographic information systems instructor at Bridgewater State University, and a practitioner in residence in the Suffolk University physics department. We talked to him for this story. A. In my senior year in college, I was abroad in London for three months and went all over Europe, catching the travel bug. Ten years later, I was making maps professionally, working for environmental firms. I started doing vacation-memory maps for friends and they liked it, but this was before we had the ability to sell on the Web like we do now. A couple of years ago, I ramped up the whole process. Q. Who’s buying these maps? A. People who love to travel, and people buying as gifts for others. When a map is done and framed, it’s a neat gift for the person who has everything, or for yourself, for a great trip you remember. And it’s good for kids — they can remember and review where they’ve been, and it makes them realize that travel is doable. Q. What do people want on them? Q. How do people get them, and how much are they? A. There’s a form at www.passportmaps.com; they drop their points on a map and type in what they want in legends, and can add photos. The maps are usually 13 by 19 inches, on 51-pound, acid-free paper so they don’t fade. The rate is $75 through Sept. 30, then it’s $99. Q. You still have the travel bug? A. Absolutely. For years, I made maps of water and power lines, but it’s more fun to map someone’s ski trip to the Alps. I can live vicariously through them and see where I want to go.